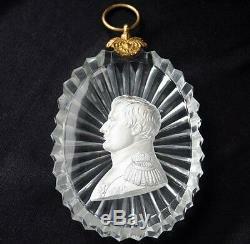 NAPOLEON I Cameo Sulphide Oval Glass Lg Portrait Medallion. PLEASE NOTE: Artificial lighting/angles used during photography to show detail may make colors appear lighter. Colors are as noted unless otherwise described. Spots are reflection from light sources unless noted. Oval rayed cut design on back and rim. 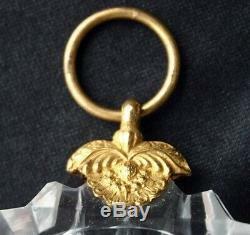 Gilt metal cap with ring for hanging. Part of a long time collection of Sulphides. Measures: 5 1/2 long including bale by 3 1/8 wide Marked: no marks found (most probably Baccarat) Condition: Very Good (tiniest of fleabites on edge, a bit of brown discoloration/staining on his hair and forehead). Please see my other auctions for more collectible Sulphides. Please ask any questions or send information that you may have. All items in usable condition when applicable unless otherwise specified. Please remember that unless specified all items have been used and will show varying signs of use/wear. Even items that were never used may show signs of age or exposure to time/elements. As a collector I always list the obvious staining/spotting/discoloration and damage/defects to material to the best of my abilities. However, some slight imperfections that will not show or affect displaying/using the item may slip by or not be considered worth mentioning. Please be very specific in your questions regarding condition. Items valued over 1000.00 will require registered with return receipt and signature confirmation. Feedback is left only after I receive yours. I cannot know if you have had a positive experience until then. I leave feedback in batches at intervals weeks or months at a time. Please be patient with receiving feedback. _gsrx_vers_612 GS 6.9.5 (612). 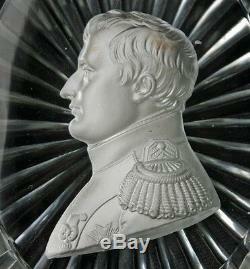 The item "NAPOLEON I Cameo Sulphide Oval Glass Lg Portrait Medallion" is in sale since Tuesday, June 16, 2015. 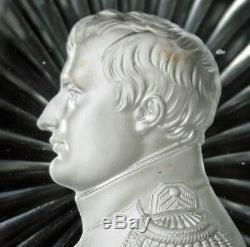 This item is in the category "Pottery & Glass\Glass\Art Glass\French\Other French Art Glass"." and is located in Miami, Florida. This item can be shipped worldwide.